The ProPlus X dive computer is an amazingly bright, low energy consumption, Thin-Film Transistor (TFT) display. Divers will have no problem seeing dive data in bright surface conditions or lowering the intensity for night dives. The large, easy-to-read screen also has an intuitive colour-coded interface, high-resolution bar graphs, and the largest, legible digits. No more squinting. Dive computers are supposed to deliver crucial data quickly and without confusion. Oceanic agrees. That's why the new Pro-Plus X combines a huge display area, the largest most legible digits on the market and an intuitive user interface with major feature enhancements. See it for yourself. 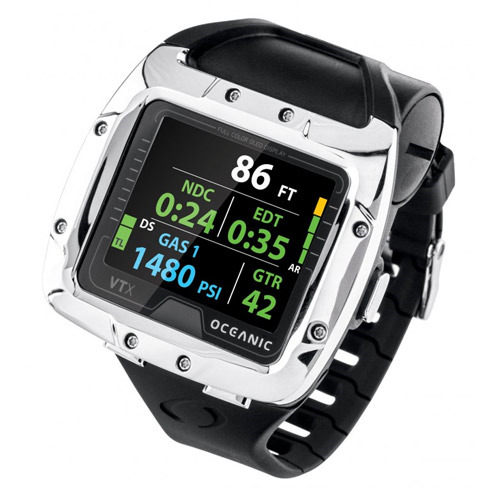 Take the Oceanic challenge: When shopping for a new dive computer, compare the displays. When it comes to viewing critical information, which would you rather see at 30 meters? The Air Time Remaining feature calculates current depth, tank pressure, your breathing rate, ascent time, and decompression status to tell you exactly how much time you can remain underwater. The Pro-Plus X Dive Computer Continually Displays Air time Remaining via a numerical bar graph in addition to cylinder pressure. You may also display air time remaining in oversized digits at any time with the press of a button. Dive Time Remaining, like Air Time Remaining, provides a real" number in minutes. This calculation combines air time remaining, nitrogen and oxygen absorption, displaying whichever allows less time. Is it a good idea to check your computer before entering the water? You bet. Could you forget to activate your computer? Sure. 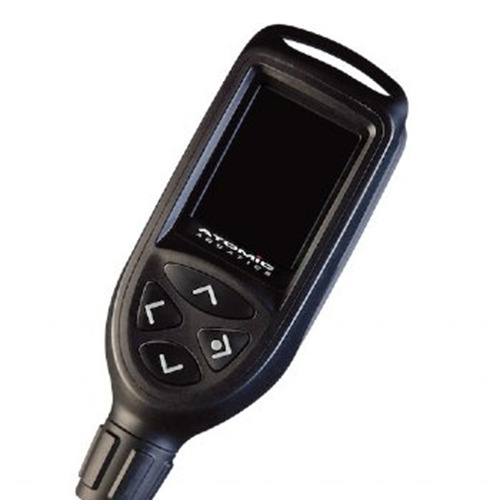 The Pro-Plus X features push-button or automatic activation, triggered by water contact. A benefit of push-button activation is easily verifying operation and cylinder pressure, but in case you forget, or simply choose not to activate your computer, it can be as simple as jumping in the water. The Pro-Plus X features a variety user-customized audible alarms. You won't miss the Pro-Plus X's audible alarm. Once triggered, the alarm will sound continuously for 10 seconds. The alarm's job is to get your attention so that you look at the computer. Once it does that, simply press the button, and it will stop. The Pro-Plus X acts simply as an air computer until you tell it otherwise. As your training and experience grow, the Pro-Plus X is designed to grow with you, being easily programmed for up to 3 Nitrox mixtures from 21% to 100%. You can also set the computer for use in an extended range gauge mode. Decompression theory can be trusted only as far as it has been demonstrated by actual test dive data. In 1987 a unique series of experiments were conducted by Diving Science and Technology (DSAT). Commissioned by the Professional Association of Diving Instructors (PADI), these Doppler ultrasound monitored human experiments conducted by Dr Michael Powell produced the most comprehensive data set that exists for recreational divers to this day. These data were used to validate the PADI Recreational Dive Planner and are the basis of the algorithm used in all Oceanic Personal Dive Computers (PDCs). 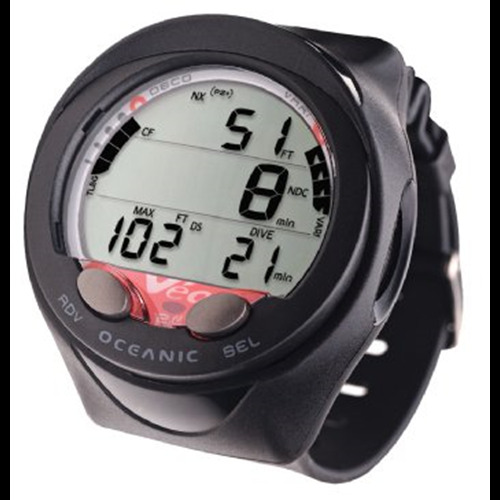 The ultimate adjustable algorithm" that's the way divers, instructors and Oceanic Pro Dealers refer to Oceanic PDCs. Oceanic's color-coded bar graphs provide complete control of your margin of safety for each dive. Want to be a bit more cautious? Make it a personal rule to never enter into the yellow caution zone, or stay one pixel away, or you get the point. Now you can even program several of our PDCs to do it for you with Oceanic's patent-pending nitrogen bag Graph Alarm; set it once and let your computer alert you when your bar graph reaches that level. A brief audible and visual alarm remind you as you approach 15'(4.6 meters), and an automatic 3-minute timer counts down to zero. As in any other dive mode, you still have access to other pieces of information, and there is no penalty should you choose to disregard the safety stop. The new Pro-Plus X is as versatile underwater as it is topside. Upon starting your dive, the Pro-Plus X will simply display your current depth, how long you can stay there and cylinder pressure. For additional functions simply press the button to see more information. Is this information important to you on a full-time basis? Leave it there. Just want to check it and then move on to another display? You can do that too. It's up to you and your new Pro-Plus X. 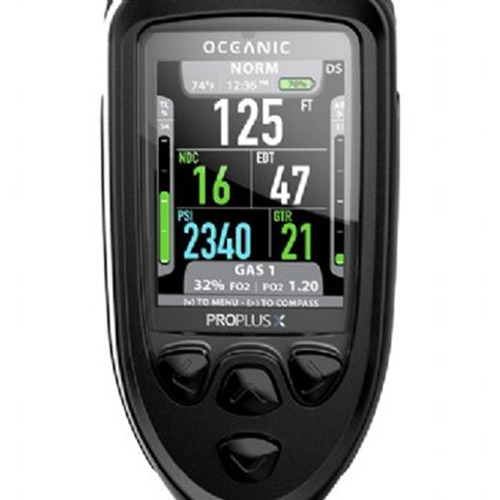 Other features of the new Pro-Plus X are; fast set menu with dual button operation, 12/24 hour format, date and time stamp, user-friendly mode icons, graphic user interface recognisable logic of green, yellow and red color-coding in conjunction with bar graphs. The diver had at-a-glance information, automatically compensate for altitude up to 4,270 meters, 24-hour fly countdown and calculated de-saturation time, variable ascent rate indicator, depth-dependent ascent rate, 99 dive (24 per day) on-unit log book, and much more!